This PL/SQL book help you develop your skills in Oracle PL/SQL tuning. 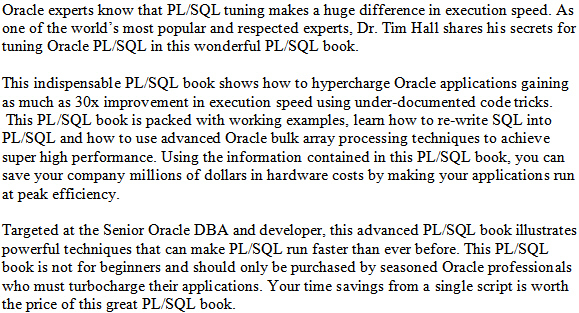 This PL/SQL book was written by renown Oracle ACE and author Dr. Timothy Hall. 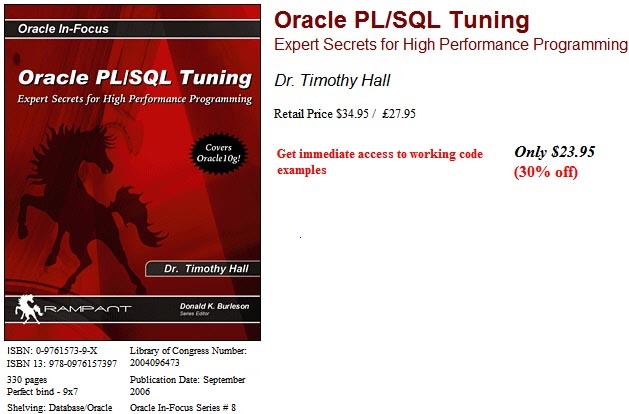 Dr. Hall's PL/SQL book contains information on undocumented tricks for hypercharging the performance of PL/SQL and the latest Oracle 10g PL/SQL tuning features. This PL/SQL book will also help you understand the bulking and direct load techniques to add millions of rows per second. Dr. Hall's easy to read explanations contained in this comprehensive Oracle PL/SQL book will also teach you how to use the forall, bulk collect and ref cursor commands. Dr. Hall is an expert in rewriting SQL into PL/SQL and will pass his years of knowledge and experience onto you in his PL/SQL book. Get step-by-step instructions for compiling PL/SQL and see the secrets for reducing context switching delays in Dr. Timothy Hall's comprehensive and concise PL/SQL book.